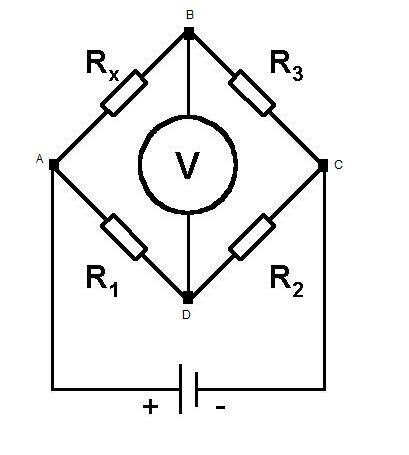 The circuit below is known as a Wheatstone bridge, a device popularized by Sir Charles Wheatstone. The purpose of the Wheatstone bridge is to measure some unknown impedance. This is achieved by 'balancing' the two legs of bridge, one will contain a variable resistor and the other the component whose impedance we wish to measure. Can you find the condition on the variable resistor needed for balance ($V = 0$) using loop current analysis? Can you find the condition for balance using a potential divider argument? If we now replace the DC voltage source with an AC voltage source of frequency $f$, add a capacitor $C_3$ in series with $R_3$ and added a second capacitor $C_2$ in parallel with $R_2$, at what frequency will balance occur, in terms of $R_1,R_2,C_2,R_3,C_3$ and $R_x$? Chemistry. Investigations. Engineering. Mathematical modelling. Forces. Rigid Bodies. Physics. Logic. Differentiation. Real world.